CJ has weathered the immediate crisis but some of the hardest road lies before us. One of the worst things is not being able to make a schedule of any kind past this week. We still haven't heard from Dr. Kahn as to what to plan and it's kind of driving us bananas. We're ready to get our lives back together and we're going to start cashing in a pile of those offers to help but until we can actually plug real events into/ an actual calendar, we're stuck. So we sit here spinning our wheels in the meantime. Not quite spinning our wheels. We're happily getting re-involved with Romp n' Roll. Our January Early Bird special went pretty well and it felt great to make volcanos again in Silly Science. The gifts/cards keep coming in and so do thoughts and prayers from all over. Keep spreading the word. The stuff that doesn't make it into the Lifertime movie of the week is still ahead of us. I'd like to be mushy again for just a moment and say nice things about my wife. Although this has been very hard on both of us, she has taken the brunt of it; mostly because she's Mom and that special bond between a mother and her child is strong and also because she has had to really let go and delegate jobs out. That takes real strength. I saw it when Charlotte was born and I'm seeing it now. There's always the time or two when I come in handy for a shoulder to cry on or a good boot to the head but she is pretty amazing overall. Don't tell her I said that. Good morning. I think the nurses here will be very happy about the fact tht I won't be here the next three nights. I'm pretty sure I was soring like a jet plane. (there's a song in there somewhere) How Charlotte sleeps through it, I'll never know. The night went relatively well. She didn't get to sleep until pretty late and one early morning med student decided she just HAD to turn on every light she could find so she could examine CJ. Nurse Amy kind of ran interference and kept the exposure down to a minimum. I must say I was nervous about a possible stepdown in quality of care but it really hasn't materalized. In fact, Nurse Amy came in at my request and started to work on Charlotte's hair. It was getting very matted. She only got through about 1/2 of it when CJ finally pooped out and fell asleep mid-detangle. We'll tackle the other half today sometime. Speaking of pooping out, that happened yesterday too. I wasn't here for the blessed event but I understand it wasn't as dramatic as last time but certainly as voluminous! Looking for reviews of virus protection software. I think the new Eee PC has goobers in it and I want to get a good package that will get all the trojans and adware and junk. Charlotte is improving every day and I really got a kick out of her last night. She ate a wonderful dinner of spaghetti, meatballs, green beans, oranges, and (of course) pudding and nilla wafers. THEN she topped it off with about 7 (and that is no exaggeration) homemade chocolate chip cookies courtesy of the Plank Family. Thanks so much! We also offered a cookie to nurse Robin and she said, "I can see why Charlotte keeps asking for more! YUM!". With the calorie intake, we were able to drop her night feedings which is wonderful. One step closer to getting the NG tube removed. I hate the waiting game. So frustrating. I'm never good at waiting for things anyway. I'm a planner and just want to map it all out. I know that even after we get a roadmap, it will just be a suggested route and "subject to change" but at least it will hopefully help us get things together on the home and business fronts. I will keep this short as I am ready for lunch and a brief respite from both hospital and Romp n' Roll before returning tonight. Dr. Khan stopped by this evening and gave a cursory summary of what is to come. They have reviewed some possible protocols based on the tumor pathology, etc. and want to avoid radiation if at all possible (yay). Instead, we will begin with three rounds of "regular" chemo. These are usually 3-day stints at the hospital and spaced about 21 days apart. Then she will have another MRI. 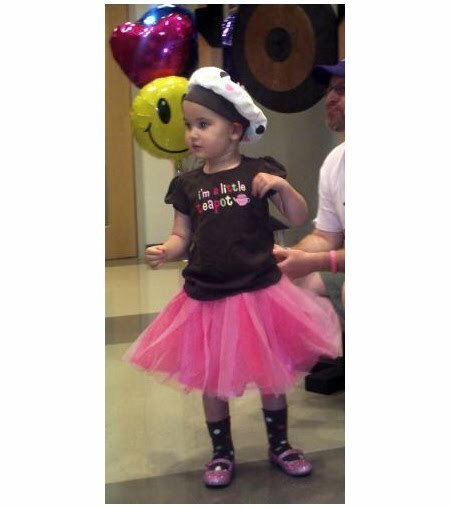 Then she will have some higher dose chemo combined with bone marrow transplants. They will use her own stem cells for these. Hospital stays during this time will be longer (1-2 weeks). After three rounds of this type of chemo, we will have another MRI. At that point, if there is still cancer present, we will discuss other options including possible radiation; however, he is fairly optimistic/confident that this will be sufficient to combat what is left of the tumor. At minimum, the course will take about 6 months. Of course, this is subject to change based on any changes in the tumor, Charlotte's overall health, and any other speed bumps we may hit along the way. None of this will start for at least 3-4 weeks. They like to wait until her post-surgery body is as healed as possible since the chemo will stop growth of any "healing" or new cells. There is a possibility that we may go home in the interim. Still waiting for word from Dr. Tye although he has checked in regularly and seems happy with her progress. She had a very busy day again with physical therapy getting her up and out of bed with lots of movement. Plus, there was more poopie today (all on her own!) and LOTS of eating. The NG tube came out which I'm sure makes her more comfortable. The flip side is now she has to take all her medications by mouth and she kinda resists that. Some of them don't taste so good. Thank goodness for milk-shake-shakes to wash them down. Of course, she doesn't know that her shakes are laced with Miralax! Ha ha! Sleeping now and peaceful. She had a great day and much thanks to Grandpa, Juanita, and Kolbey for entertaining her this afternoon. I'm tired but otherwise "ok".